Once again, are seeing more and more ISPs censoring, blocking and/or deleting emails with substantial content like this newsletter. So, if you suddenly find you are not getting your Cloudeight InfoAve Premium newsletter every Friday, the first thing to do is to check your junk/spam folder. If you find our newsletter there, be sure to mark it as not spam / junk. Also check your mail filters, and be sure to add cloudeight-news /@/ thundercloud.net to your address book. Our InfoAve Premium newsletter has been sent every single Friday for over 13 years, and we will continue to send it every Friday. In the meantime, if you miss an issue you can read our most recent newsletters on the web here. Please bookmark that page and you'll never miss a single issue of this newsletter. Thank you! We're giving everyone a chance to choose the price you pay for any of the following Cloudeight products & services. Create your own great deal, help celebrate Cloudie's birthday and help us too! Cloudeight Direct Computer Care Season Ticket - Unlimited Computer Care for one full year ... a great deal! Hurry, Hurry, Hurry! Step right up and help us celebrate Cloudie's 17th Birthday and Pay What You Like! Get more details and pay what you like ... here! REMINDER: Cloudeight Backup and 2018 CleanSweep Special Pricing extended though this weekend! Just a reminder! We're offering special intro pricing through February for our new Cloudeight Backup Service and our 2018 CleanSweep service. Both available through this Sunday. Get more information about our Cloudeight Backup Service here. Get more information about our 2018 CleanSweep Service here. It is getting old now but I am hanging on a bit longer with the help of both Darcy and TC. You have saved me money instead of going to someone else. Thanks a million. Thelma. Just to complement Darcy on her Time and Patience this afternoon installing my Ashampoo Back Up software after my servers over secure security. Thank you again. Brian B.
I just wanted to say how impressed I was with my Ashampoo Backup session with Darcy today. It was a pleasure to watch her work. I was amazed that Ashampoo was able to finish my backup so quickly since my C drive is loaded to the gills. But I have two added benefits. I deleted my Backblaze account which saves me $50 a year. My PC works better without Backblaze running in the background. You guys are awesome. Many Thanks! Actually, I wanted to thank you for your support through the years. I purchased a lifetime membership, bought Folder Magic, Smileycons, a key or 2, along with Emsisoft (which I still need to contact you to install and use). I just donated $10 (wish it could be more, but living on $733 a month isn't easy); but you have given members SO much free info (also the Hill) through the years that most (if not all) websites would have charged much more for. I'm also sure you saved me (and some friends) a small fortune through the years as I was able to fix many PC problems using the knowledge ! you imparted. So I really just wanted to say thank you. I hope enough people can and will support all your efforts, as we would all be lost, and would have lost a lot of money, without all you do. A big Cloudeight "Thank you!" to Thelma, Brian, Pat, Peggy, Martha, Gina and everyone who wrote to us last week. We appreciate your kind words and your support very much! EB & TC Get more information about Cloudeight Direct Computer Care here. When I tried to watch a DVD on my newer Windows 10 PC today I could not play it. I used to use Window Media Player on Windows 7. Isn't Windows Media Player in Windows 10? How do I play movies on Windows 10. Do I have to change a settings or something? I did a search and it said that Windows 10 doesn't come with Windows Media Player. What do I have to do or download to play movies on my Windows 10 computer? I trust your advice and recommendations. What do you suggest I do? Hi George. Thank you. Windows Media Player is included in Windows 10. You can use it to play most audio file types. But one thing you can no longer do with it is watch DVD Movies. Luckily, there several excellent free media players you can install on Windows 10 that will play you DVD movies (and also music). 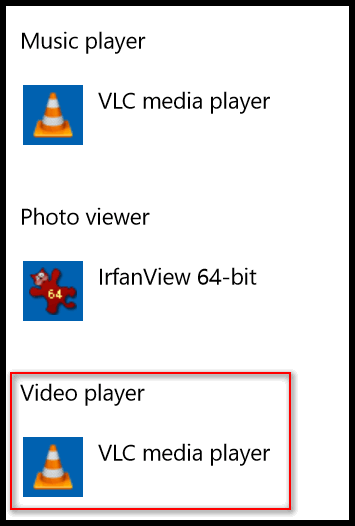 The media player we use and recommend is VLC (Video LAN) media player. It's free and it works seamlessly with Windows 10. It will play your DVD movies, and virtually all other types of video and audio files. You can download VLC media player from this link. It's free and free from malware and tricks. One you download and install VLC Media Player, you should set it as your default video player Windows 10 by going to Settings > Apps > Default apps (or Settings --> System --> Default apps if you're using an older version of Windows 10) and click on Video Player and select VLC from the list. Once you have VLC set as your default Video Player, you will be able to watch your DVD movies. We also use VLC as our default music player, but if you want to continue to use Windows Media Player to play your music files that's your choice. Since Darcy reset up my Thunderbird February 8th and I had her add a second address, I am told I no longer need the second address. Every time I download my email it also downloads the second email and I no longer need that. How can I remove/delete a second email address in Thunderbird? I've tried selecting the address and deleting it but I get a message that there must be an email address there and it won't remove/delete the second address. That should get you back to just your one address. Judy wrote back: "Darcy, Thank you so much. It worked just as you said it would! If I knew you would reply on Sunday, I would have waiting until Monday to send my question. So sorry for interrupting your weekend. I will send a small donation tomorrow in appreciation for your help. Thanks again. Judy"
We've got an update for you. 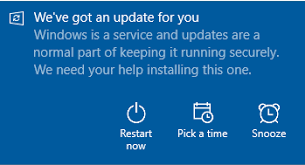 Windows is a service and updates are a normal part of keeping it running securely. We need your help installing this one. Usually update don't come in with such an announcement so I'm asking you. I am feeling uncomfortable about this. Hi Mae. If the notification looks like the one below (your color may be different) then it's legitimate. Mae wrote back: "Thanks for the reply. I will run the update today. I do appreciate your prompt reply. It's too bad that we have to be so suspicious. Mae"
When I use your tip (in last week's newsletter )to see my downloads using Ctrl+J nothing happens. It doesn't work for me on Windows 10 or on Windows 7. What could I possibly be doing wrong? I use Chrome on both computers. Hi Barb. It only works in browsers. Open your browser (Chrome, Firefox, Internet Explorer, Edge, Opera etc.) and while it is open and on top of other windows, hold down the Ctrl key and tap the J key. Try that and see if that works for you, Barb. Hi Linda. Thanks for the nice comments. Windows 10 "Photos" has a feature that lets you make videos from your pictures and you can add transitions and music too. 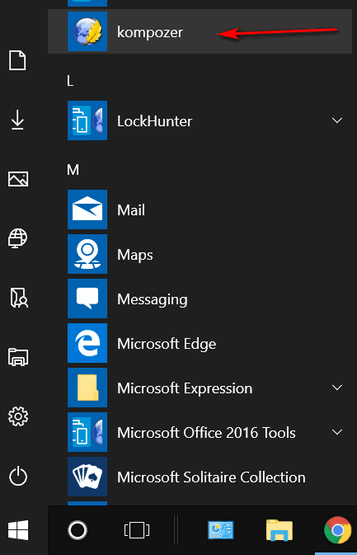 Just open your start menu and find the "Photos" app. Open it and at the top click "Create" then choose "Custom video with music". You can add photos, music, and transitions. You can save your video in a sharable format that you can upload to Facebook or other social media sites. 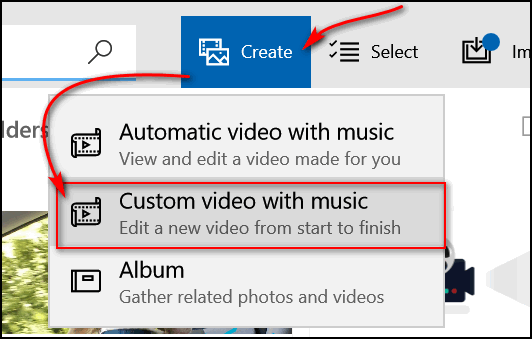 We created a very short tutorial on using the Windows 10 Photos App to create videos. You can see our tutorial here. OE Email Backup Genie; what happened to this program? Yes, I know it's not yours, but I thought you had your own email backup program. And if not do you have a recommendation of a current email backup program that works with Windows 7? I'm thinking MozBackup since I'll be using Thunderbird. Does any of your Information Avenue Premium Issues cover transferring from Outlook Express to Thunderbird? I don't need any help setting up Profiles, but I may need some help setting up folders and making sure the proper email goes into the proper folders. Hi Jon. You really don't need a backup program as long as you setup your email as IMAP, since IMAP completely mirrors/syncs your email with the mail on the server (online). Even if your computer has to be replaced, all you have to do is setup Thunderbird on the new computer and all your mail will be there since it is synced with the mail server. Personally, I would never backup mails since you could end up with thousands of duplicates, depending how far back you save mail. You can refer to this page for help with that though. We once made a backup program for Outlook Express, but that was a long time ago, back when most ISPs did not offer IMAP as an email option. We are aware of anyone using Outlook Express without XP, nor do we have an XP computer around, we have no idea on exporting from Outlook Express. Larry knows about strong passwords - but what about usernames? Hi I know I need a very strong password but do I also need a strong username too? Hi Larry. The password is the key to everything. It does not matter if your username is 123 if your password is #c[u84$+^3n!Hq . It work take billions of years to crack that password according to https://howsecureismypassword.net/ . Many sites, like Google for instance, use your email address for a username. And, of course, the best way to generate, save, and use strong passwords is by using a good password manager like LastPass. REMINDER: Cloudeight Backup and 2018 CleanSweep Special Pricing extended through Sunday. Just a reminder! We're offering intro pricing through February for our new Cloudeight Backup Service and our 2018 CleanSweep service. Both available through Sunday March 4, 2018.. Note: If you’re using Firefox, IE, Opera or other browsers, you can drag the URL from the Address bar on any browser to your desktop. If you use Chrome and you’d like to put a shortcut on your desktop or taskbar to Facebook, Gmail, Outlook.com, Twitter, Cloudeight InfoAve  or any of your favorite sites, it’s super easy to do. 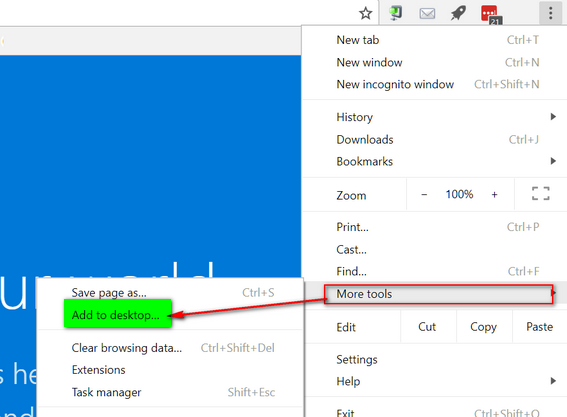 In Chrome, visit the site you want to create a shortcut to. Click on the settings icon (3 vertical dots) at the top right corner of Chrome. Click “More tools” then click “Add to desktop”. That’s it! And there they are. Now if I want any of those on my taskbar, all I have to do is right-click on one and choose “Add to taskbar”. See? I’ve added Cloudeight InfoAve Tips & Tricks web site and the Gmail account I used most to my taskbar. It’s quick and easy. Try it! Go to a web page you want to pin to your Start menu or taskbar. 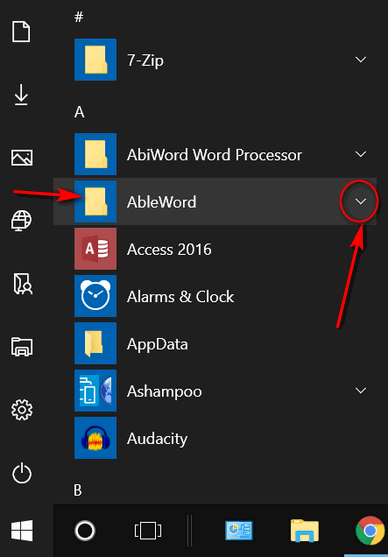 Then click on the settings icon (3 horizontal dots) and click on “Pin this page to the taskbar” or “Pin this page to Start”. First, Fresh start is available only on Windows 10 Creators Update, Fall Creators Update and newer versions of Windows 10. Many computer manufacturers included a recovery partition on the hard drive that allows you to restore your computer to the same condition it was in the day you bought it. Each computer manufacturer has its own procedure for performing a factory reset. Since doing a factory reset wipes everything off your computer and puts it back to the exact state it was in the day you bought it, it should be your very last choice if you are having serious problems with your computer. Another thing to keep in mind: If your computer had Windows 7 or Windows 8x on it when your purchased it, and you upgraded to Windows 10, and you do a factory reset, your computer will be running Windows 7 or Windows 8x when the factory reset has completed. However, you can re-install Windows 10 without having a product key. The Windows 10 key was hardcoded to your computer when it was installed (or when you upgraded). 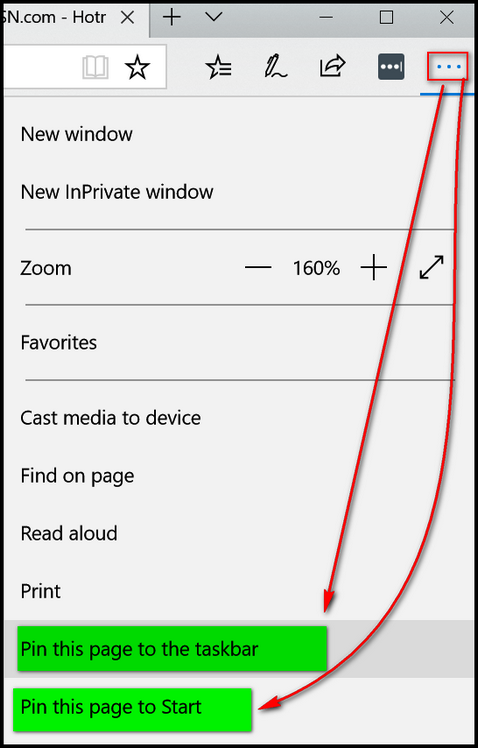 You can create Windows 10 installation media by following the instructions on this page. During the installation process, when you're asked for a product key, choose "Skip" and go on with the installation. Be a Text CTRL Freak! This tip will work in any email program like Thunderbird, on it most web mail programs like Gmail and Outlook.com. It also works in word processors like Microsoft Word and similar. It will also work in WordPad which comes with every version of Windows. You want to make a sentence or word bolded, just highlight the word or sentence and press CTRL + B. See? If you want to underline a sentence or word just highlight the sentence or word you want to underline and press CTRL + U. See? If you want to italicize a word or sentence, just highlight the word or sentence and press CTRL+ i ... See? If you want to make a word or sentence bold and italic and underline, just highlight and press CTRL+B, CTRL+ i and CTRL+U. SEE? If you want to make a hyperlink (a link to a web site) highlight the word or phrase and press CTRL+K. When you press CTRL+K a dialog will appear, type or paste the web site address (URL) into the address field, and viola! You have a link to a web site. See? And if you want to create a new document press CTRL+N. There are many more tricks like this. CTRL+C copies the selected text. CNTL+V pastes the copied text. If you accidently make a change or delete something you didn't mean to change or delete, if you press CTRL+Z right away, it will undo whatever you've done. His Nebraska license plate is OU812, the last 4 digits of his phone number is 4419 and his name is Dan. As you can see we used asterisks to separate them and the @ sign for the a in Dan. Oh so clever! And Dan, you’re pretty safe. According to www.howsecureismypassword.net it would take a computer one trillion years to crack that one. 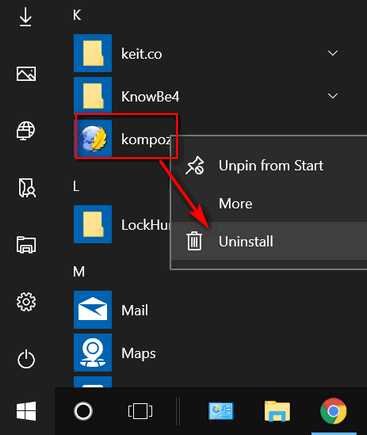 Did you know that in Windows 10 you can uninstall programs right from the Start menu. And you can even uninstall some (but certainly not all) Windows apps. It is really easy to do, but if you haven’t tried it before there’s a few things you need to know. 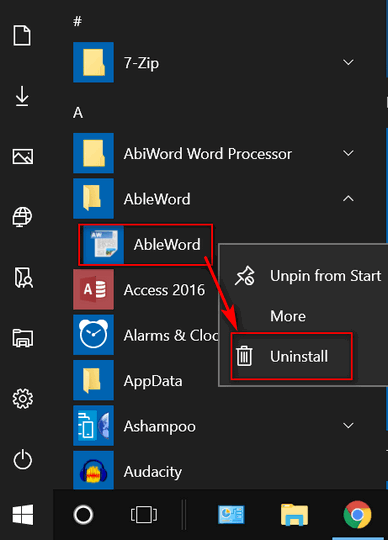 For our example, we’re going to uninstall AbleWord (not really – it’s a nice program). In order to get uninstall some programs you have to expand the folder. 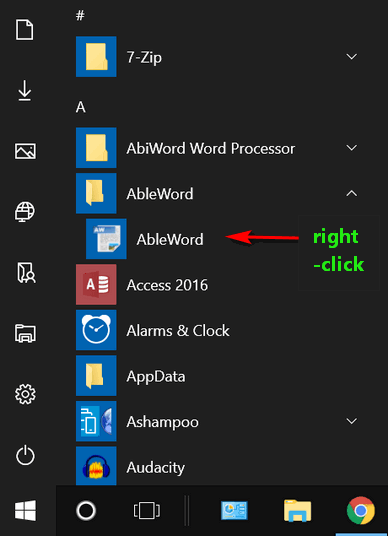 As you can see AbleWord is one of those programs. So, to expand the folder, just click on the down arrow to the right of the program’s name. See? After you’ve expanded the folder, find the program and right-click on it. After you right-click the program’s icon, you’ll see a menu appear… click “Uninstall” from the menu…and proceed. As of Windows 10 Fall Creators Update (version 1709), when you click “Uninstall” you’ll find that Control Panel > Programs > Uninstall a program opens. But we expect that soon, when you uninstall using the Start menu in future versions of Windows, the Control Panel step will be skipped. Just right-click the name of the program and you’ll get the uninstall menu. Do you think it’s easier to go to Control Panel > Programs > Uninstall a program or use the Start menu? Whatever way you choose, if it works for you, that’s great. But at least now you know another way. Note: Revo Uninstaller & Geek Uninstaller are both excellent programs that can help you remove programs and all (almost) traces of them. Both are much more robust than the using the program's uninstaller. Also, Reg Organizer has a great uninstaller included - along with many other useful Windows utilities. Not Exactly Windows Movie Maker... but It Works! Our annual spring donation drive is underway. If you don't need any of our products or services right now, please help us with a donation. Even the smallest gift is appreciated. Every donation helps us to provide useful information that helps you with your computer as well as helping to keep you safe on the Internet. We offer free help to thousands of people every year... and we offer an honest and inexpensive computer repair service too. We do everything we can to help you with your computer and keep you safe too. This Cloudeight Site Pick is a real time-waster and a real eye-opener. It's called Streetmotive.com. This site digs up the most oddly (stupidly?) named streets all over the world. Click the "Let's Go" button to get started. 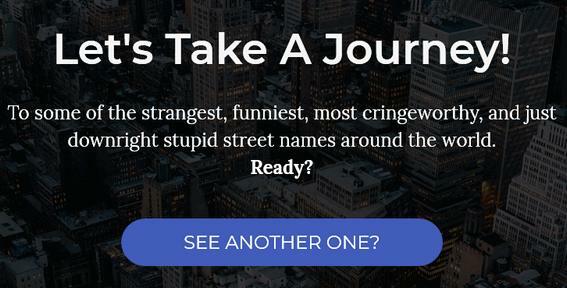 Once you get started, you'll want to keep clicking the "See another one button" to turn up more oddly named (stupidly named) streets. And to make it even more fun, the street's (roads, courts, avenues) are shown on map. You can zoom in on the map to take a closer look! Here are a few that we found that we are brave enough to include in this newsletter - trust us there are many many more. Bossy Boots Drive (Allen, TX, USA) *This is where EB ought to live! There are many more that are actual street names that are right out there in front of everyone somewhere in this world, that we would not feel comfortable including in this newsletter (although we had many a chuckle reading them and looking at them on a map). So, you'll just have to go look for yourself. FAIR WARNING: If you're easily embarrassed or especially prudish, then your best bet is not to visit this site. For everyone else, visit our site pick Streetmotive.com. Be sure to keep clicking the "See another one" button. You'll see a lot of repeated street names, but the gems are mixed in. So, keep on tapping that button and you'll be rewarded - or appalled. Keep in mind that these are actual street names. So, how bad can they be? What a great time waster. We wasted over an hour on the site and who knows how long writing this article! Take a trip down Cloudeight street and visit this Cloudeight site pick right now. If you purchased or renewed Reg Organizer through Cloudeight within the last 12 months, you're entitled to a free version upgrade to Reg Organizer 8.5. On the news site yesterday, I saw a ten-minute clip of millions of starving children in Africa and didn’t see a single angel there. What I saw were ravaged children with bloated bellies, being caressed by weeping desperate mothers..
What does Windows as a service mean? Windows as a service was introduced with Windows 10 as a new way to update and service the Windows operating system. So, instead of releasing new versions of Windows every three or four years - like Windows XP, Windows Vista, Windows 7 - Microsoft will continually update Windows 10 in two distinct ways: Feature updates and quality/security updates. Windows 10 "Spring Creators update" version 1803 - tentatively scheduled for release in April 2018. Quality and security updates are cumulative updates that come out at least once a month. They contain security patches and operating system fixes to make Windows 10 work better and be more reliable. Because these updates are "cumulative" the latest update includes all of the updates that came before it and overrides previous updates. Each feature update will continue to receive quality and security updates for approximately 18 months after its release. Sales of the following products and services help support our newsletters, web sites, and computer help services we provide. Cloudeight Backup Service: Professional setup of a complete backup system including creation of rescue media, image backups, incremental backups, Cloudeight Direct Backup session key and a lifetime license for Ashampoo Backup Pro 11. Get all the details here. Thunderbird Email Setup: Thunderbird is a great email program that you can use with your Gmail and Outlook.com (Hotmail) web mail accounts as well as with your Internet provider's email. We'll set it up right for you. Our set up includes configuring up to 3 emails accounts, and setting up Thunderbird to use stationery (if desired). Our Thunderbird Email Setup Service is always a great deal. For more information visit this page. Reg Organizer 8.5: Reg Organizer is the Swiss Army Knife of Windows tools. It's far more than just a registry optimizer and cleaner... it's Windows all-in-one toolkit. Helps you keep your computer in tip-top shape and also helps you solve annoying Windows problems. Reg Organizer works great with Windows 10 too! Get more information about Reg Organizer (and get our special discount prices) here. If you don't need any of the above products or services at this time, please consider helping us by making a donation. Everyone who makes a donation is invited to become a Cloudeight Booster and is eligible for special Cloudeight Booster Freebies and special Cloudeight Booster sales. Please consider making a small donation today. Thank you so much!